The librar y continues its multiyear project to evaluate the print collection, deselect out-of-date materials and add resources where there are gaps. During this process, we occasionally come across forgotten little gems or items of interest. 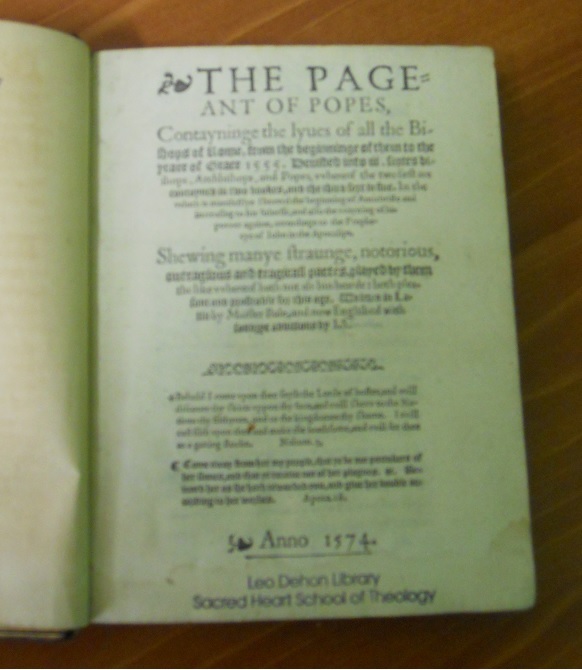 Here’s one of them: The Pageant of Popes, printed in 1574 in London, and dedicated to the Earl of Sussex. For the non-history buffs out there, Lord Sussex was Lord Deputy of Ireland under both Mary Tudor and Elizabeth I – a major political feat on its own. The book was originally written in Latin by John Bale (1495-1563) and ‘Englished’ by John Studley, 1545?-1590?.